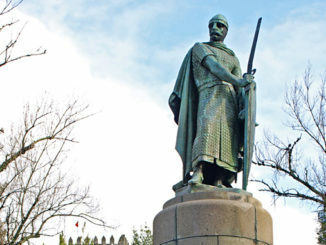 “This is as far south as I’ll go in Portugal,” commented a man from Porto I met recently. He was referring to Setúbal, where he spent many weekends. Had I met him before we headed to Portugal’s deep south for a family meet up I’d have been even more apprehensive than I was. The Algarve has never been a place to stir the wanderlust in me. I associated it with golf, Clive Dunn, nice beaches and not a lot else. However, my sister chose Albufeira to celebrate her birthday and we were already in Portugal, albeit 400 miles away beyond the back of beyond. The drive south was long and hot, another day when the temperature gauge melted around the mid 30s mark. Many roads in Portugal are straight, empty affairs. It makes for simple but not particularly interesting driving, especially a drive south through uninspiring countryside where there was a lack of anything… including restaurants. Lunch finally took place at 3pm in Ourique, a town famous for an epic battle between Portuguese and Moors in the twelfth century, because it was the first place there was somewhere to eat. Ourique must also be known for pigs as there were a few sculptures of porkers dotted around. Appropriately, lunch consisted of a brace of bifanas (savoury pork butties) in a bar populated by grizzled men occupying a table each. Fifty minutes after devouring the bifanas we arrived in typical resort land; the valley of cork trees and a couple of small farms we’d been gazing at for two months swapped for billboards advertising holiday activities, characterless apartment blocks and shirtless holidaymakers. These types of resorts have the same interchangeable ingredients irrespective of whatever country they’re in. A vague uneasiness that settles on my shoulder in manufactured environments was softened by the fact that our drive was over and a cold beer beckoned. Whilst my family were staying in a villa we’d booked into the Hotel do Cerro; a smallish and quite stylish hotel not far from the old town. 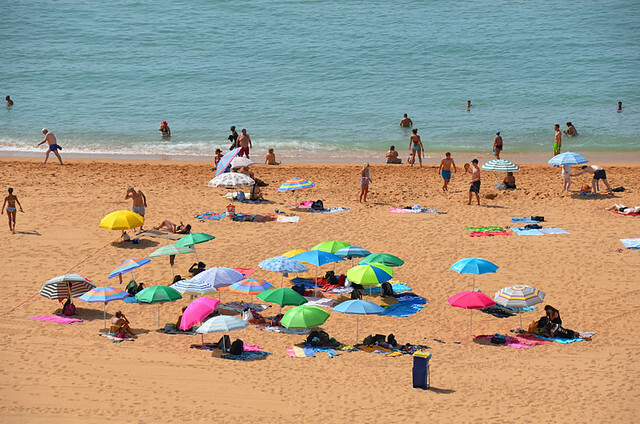 The staff at the hotel were so friendly and welcoming I found myself thawing toward Albufeira. The other guests were decent; a multi-cultural mix of varying ages with no obvious oiks. We were, apparently, on the right side of the town. A couple of kilometres across the bay was the Strip, a holiday hell (depending on personal preferences) of tacky bars frequented by sloshed Brits – so my nephew who’d holidayed there told me. The area around the Hotel do Cerro seemed okay, having residential as well as tourist accommodation. Our first venture into the old town and ‘seemed okay’ was promoted to ‘actually quite pleasant’. Our meandering route took us above Praia do Peneco, a stunner of a golden beach with elevator access and a stand out lone rock, before gently descending on narrow lanes from clifftop to sea level. The old town wasn’t what I’d expected. 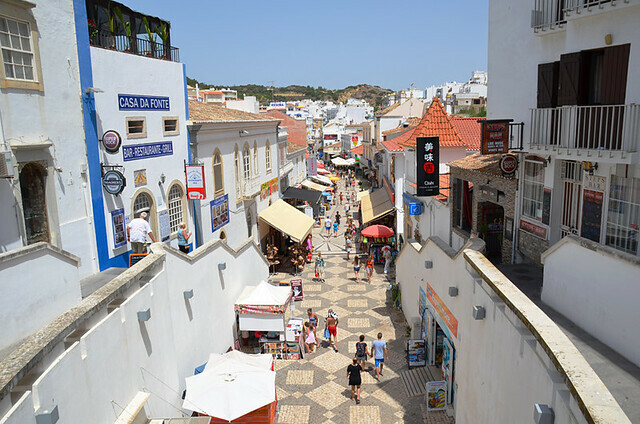 I’ve seen the ‘former sleepy fishing village’ tag attached to resorts which were anything but; however, the cobbled streets, azulejos, little churches, traditional restaurants, and neat houses with tiled facades combined to give Albufeira a picturesque personality. It still exuded a real town vibe. But Albufeira wasn’t as charming as it could have been. 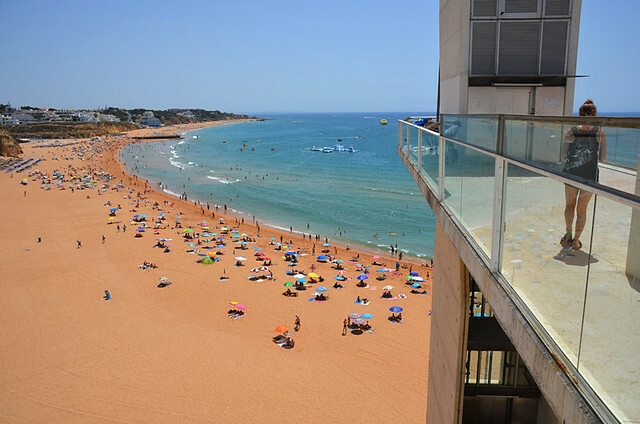 The further east we strolled, the more its Portuguese personality was replaced by a homogeneous Brit resort one. What should have been a pretty square, Largo Eng Duarte Pacheco, was lined with bars and clubs with names designed to pull in Brit holidaymakers seeking familiarity rather than differences. It represented a border patrolled by guards in Premier League footie shirts that we had no inclination to pass. There were eleven of us, not an easy number to fit in a restaurant. 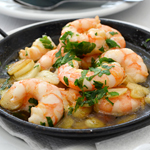 On our first night we were split into two groups in Rossio, a traditional restaurant on the clifftop between the main beach and the marina. 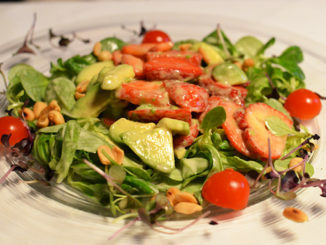 The staff were above and beyond accommodating and the food was good enough to satisfy the tastes of three different generations, aided by generous flamboyant cocktails. Incidentally, they do very good choco frito (fried cuttlefish), tasty enough to impress folk who might normally shudder at the idea of putting a cephalopod in their mouth. As we were in Albufeira for a birthday party weekend most eating and drinking was done around the cool pool in the rather snazzy villa my sister had rented; an excellent Intermarche supermarket on nearby Sir Cliff Richard Avenue providing the catering. 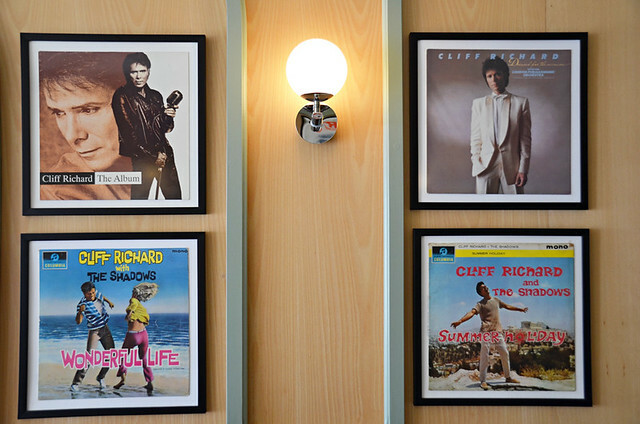 Sir Cliff Richard Avenue… classy. 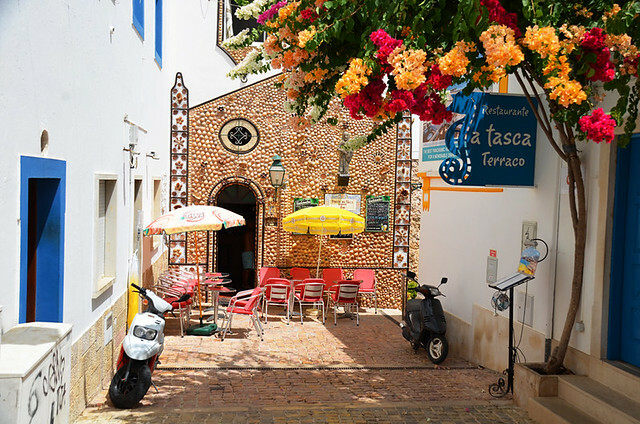 One evening, Andy and I excused ourselves from the non-stop buffet BBQ at the villa in order to satisfy a yen that had developed over two months in the Alentejo hinterland – pizza. We went AWOL to Saffron, an Indian restaurant on Rua Samora Barros. Yes, it also struck us as being bizarre to order pizza in a tandoori restaurant, but a nephew highly recommended them. The pizzas were fine but, unsurprisingly, not quite your normal Italian pizza; there might have been frying involved. Below the Tandoori was a decent live music bar, Arte. On one ‘need to cool down with a cerveja’ visit it was full of British Hell’s Angels whose main topic of conversation was the use of herbs and spices in cookery. Never judge a leather-clad book by its cover. 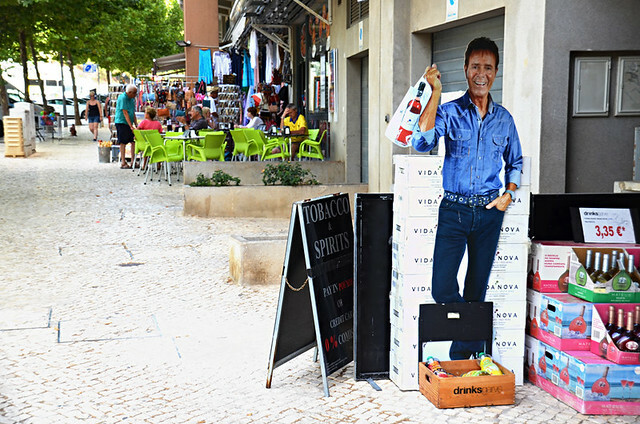 Albufeira’s adopted singing son smiled benignly from many shop windows, usually jauntily holding a bag of his Vida Nova wines. 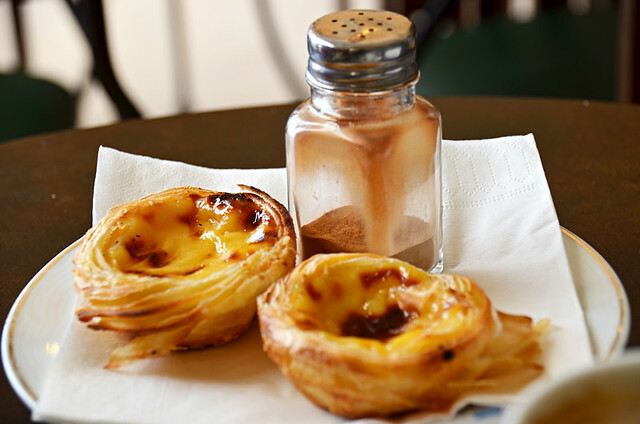 He has a Quinta (estate) and vineyard nearby.. Ducking into a cafe on Sir Cliff Richard Avenue to escape the heat, we sipped coffee and ate pasteis de nata in what would have been a funky coffee house, save for lots of Sir Cliffs smiling down at us from album covers on the wall. I actually like the odd connection, taking a selfie with arms wrapped around a cut out of Sir Cliff adds an amusing quirk. 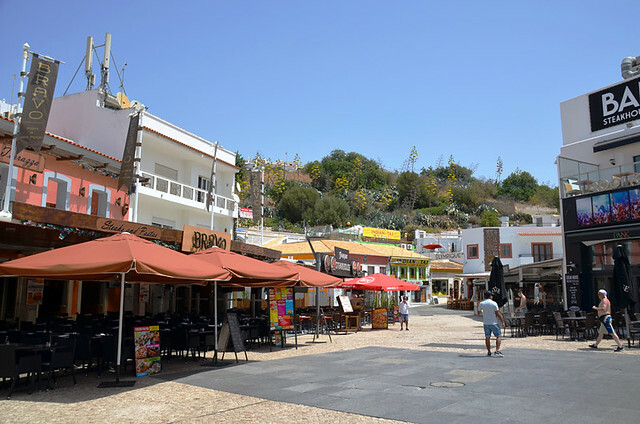 Albufeira wasn’t the bland, soulless holiday resort I’d feared. It has lost a chunk of its personality to mass tourism, but there’s enough character left in the western half of town to make it a pleasant enough destination to spend some time in… plus its beaches are undeniably spectacular.